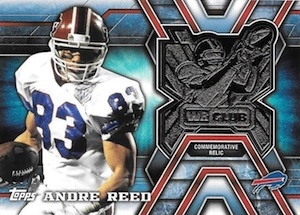 2014 Topps Football once again brings a broad mix of base cards, inserts and hits for what is, traditionally, one of the most widely collected gridiron sets of the year. Rookies and fantasy football elements get particular attention for the set. Hobby boxes once again promise one autograph or memorabilia cards while jumbo boxes have a pair of autographs and a Rookie Patch card. 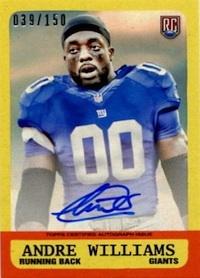 The 2014 Topps Football base set has 440 cards. Besides basic rookie and veteran cards, subsets include team cards and award winners. Numbered parallels include Gold, Pink, Salute to Service (previously Camo), Black, Platinum and Printing Plates. Fantasy football is the subject of a pair of basic inserts. 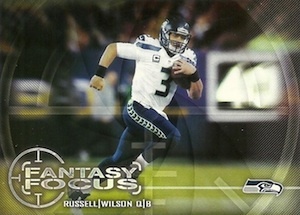 Fantasy Focus (55 cards, 1:6 packs) features top fantasy players. Fantasy Strategies (35 cards, 1:6 packs) are have copy from NFL.com writers. Each card offers collectors an approach to building their fantasy squad. 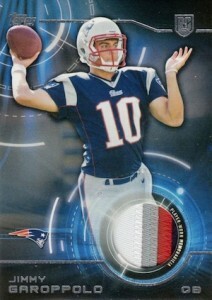 2014 Topps Football has several other basic insert sets as well. Greatness Unleashed (65 cards, 1:4 packs) spotlights top players. 1,000 Yard Club (37 cards, 1:4 packs) and 4,000 Yard Club (nine cards, 1:6 packs) return with running backs, receivers and quarterbacks who surpassed key stat milestones in 2013. The 1963 Topps Mini cards set is large for an insert set, clocking in at 132 cards. Mixing rookies and veterans, they're inserted 1:3 hobby packs. 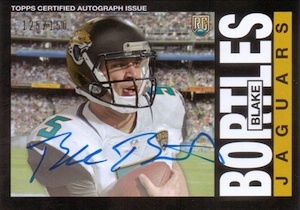 Autographs come in several varieties in 2014 Topps Football. Numbered Base Rookie and Base Veteran Autographs are essentially parallels. They use the base card design with a sticker signature. These also come with Variation photos. Topps Autographs come with a different design from the base cards. Collectors can find multi-signed cards with numbered Rookie Premiere Dual Autographs, Quad Autographs and Ultimate Signatures, which, in the past have had signatures from all of the event's participants. Retro-themed signatures are randomly inserted in the form of 1963 Topss Mini Rookie Autographs, 1965 Topps Rookie Autographs and 1985 Topps Rookie Autographs. Other signed sets include NFL.com Fantasy Stock Watch Autographs, Autograph Relics, NFLPA Rookie Premiere Autographs and Rookie Autographed Jumbo Patch cards. Also in the product are one-of-one Rookie Premiere Autographed VIP Passes. 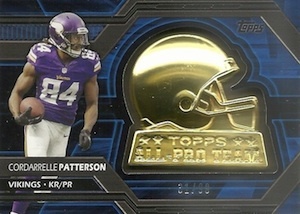 Although not a major focus, 2014 Topps Football has a few different memorabilia sets. 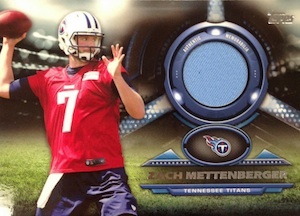 Topps Relics have jersey swatches from a broad mix of players, ranging from youngsters to retired stars. 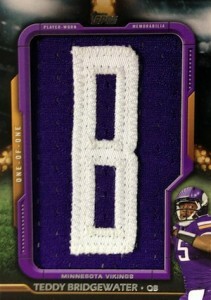 In the Name Relics feature a full jersey letter, all numbered one-of-one. Topps Rookie Patch cards are exclusive to jumbo boxes. These all have a multi-color patch swatch. Commemorative relics have a variety of themes. Quarterback Club, Running Back Club, Wide Receivers Club and Defensive Club feature top players at each spot. The All-Star Rookies checklist focuses on the Rookie of the Week players from 2013. Other manufactured relics include All-Pro Class and NFL Captains Patch. The Power Players online code program that started in 2014 Topps Baseball carries over to the gridiron with its own version. The fantasy-style program has prizes including a trip to the 2015 NFLPA Rookie Premiere, exclusive parallels, autographs and memorabilia. 109 cards. Click here for a detailed guide. 15 cards. Serial Numbered #/75. 31 cards. 1:36 Hobby packs. 15 cards. 1:36 Hobby packs. 38 cards. 1:36 Hobby packs. Good: Deep checklist, variety of cards, good photography, budget pricing, added focus on fantasy side of the game, Power Players come to football. Bad: Most of the inserts sets are huge, lack creativity and add little to the product, Play 60 and PPK insert cards seem like overkill, too many dime-sized, single-color jersey piece cards. 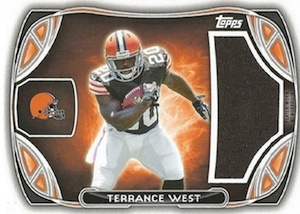 The Bottom Line: 2014 Topps Football is a bloated interpretation of its former self. Normally popular with set collectors because of the thorough base checklist, the many inserts make it more difficult to complete the set and this problem is furthered because the inserts themselves feel like an afterthought. Continuing an ever-escalating trend in the hobby, variations are out of control in 2014 with 100+ options, and most feature subtle differences from the base card and no definite theme across the board. The base design does not stray too far from the norm with a mostly white border, colorful bottom nameplate, and a few splashes of foil. It is unlikely to wow anyone, but it works and I think it looks slightly better than the 2013 design. Although you will end up with a large stack of inserts after breaking into a box of 2014 Topps Football, they are all quite similar. Fantasy Strategies, Greatness Unleashed and 1,000/4,000 Yard Club each present a vertical layout and obscured background. Fantasy Focus simply offers a horizontal design in addition to the obscured background. The only thing that stands out to me among this group is the back of the 1,000/4,000 Yard Club cards as they present a 2013 game-by-game stat breakdown for each player. The one insert with a distinctly different feel, mini cards bring good color and a nice artistic feel, but the 132-card insert set is way too big. This is not an isolated incident. Greatness Unleashed adds another 65 cards and Fantasy Focus checks in at 55 cards. These are big insert sets in a product mainly centered around a big base set. The PPK and Play 60 inserts are a whole different story. In addition to the childish look and tepid response from collectors, these filler cards have no real business being in this product. Topps would have been much better off including these in special packs for giveaways at kid-centered events. The only other common element in the product is the various base parallels. The differences are minimal, but still easy to spot, and they are are not overdone, which is a plus. Hits fill the last spot in each Hobby box, but with only one per box, there is a good chance that will end up being a plain jersey card. 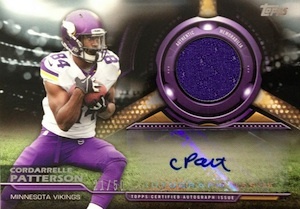 The checklist is normally one of the best things about the flagship football product from Topps. Sure, there are always a few worthy players that might miss the cut, but this tradition continues in 2014 and set collectors have plenty to work with. The problem with the checklist lies with sheer number of other cards that fill the many insert sets. Just when it seems like variations have reached their saturation point, they come back stronger. With proper usage, variations can offer a intriguing option for collectors. Unfortunately, 109 variations without a central theme is hardly proper usage. 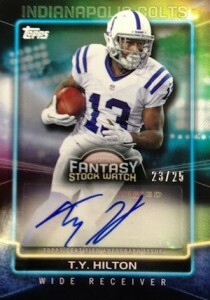 Fantasy football is not going anywhere and Topps made a good call giving it a focus in 2014. However, you can't just slap "fantasy" on an insert and call it a day. Fantasy football changes each day, so outdated advice, like what is found on Fantasy Strategies, is not really the way to go. Maybe they could do something like "Fantasy Saviors," which would provide a detailed breakdown for players who had the biggest individual fantasy performances each week in the previous year. Another way to go would be a "Fantasy Sleepers" insert that highlights potential breakout players based on advanced metrics. Value is always a tough concept when dealing with a base Topps product. 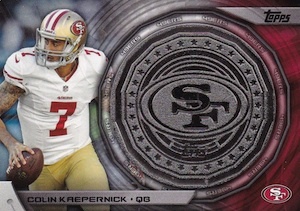 The expectation is a bunch of base cards and inserts, some low-numbered parallels and one hit. 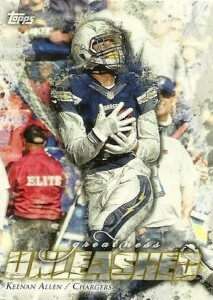 It is hard to punish 2014 Topps Football for being a budget product when that is what it is intended to be. Unfortunately, this is not the overall quality that collectors have come to expect. Even if you end up with just a plain jersey card as your sole hit like me, the real issue is the filler cards that cheapen the experience and ultimately hurt the value. 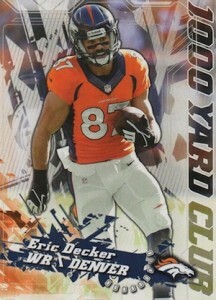 Topps Football is a simple collecting look at the upcoming season. As one of the purest examples of a football product geared toward set collectors, the fun lies in the little things. Gimmicks and unnecessary or irrelevant inserts can cloud that experience, but the fun is still there if you have the right mindset. 2014 Topps Rookie Patch#TRP-JMR Jordan Matthews 4-COLORS!! 2014 Topps Valor Sammy Watkins Rookie Jumbo Relic Jersey Card VJR-SW in MINT! In order to maximize both the aesthetic appeal and monetary value of your collection, it's absolutely crucial that you store them using the correct high-quality supplies. We've made it easier than ever by putting together the first ever set-specific card supply guides. Each 2014 Topps Football subset is listed below according to which type of Ultra Pro toploader and Magnetic Case you should use for storage. Click any of the (ebay | Amazon) hyperlinks below to shop for the best deals on the given supply type. Lot of (100) Ultra Pro 1 One Touch Magnetic Card Holders 35pt New! The players haven’t been unveiled yet. 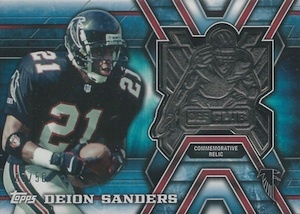 Traditionally, are rare inserts such as Printing Plates more commonly found in the regular Hobby boxes or Jumbo boxes? Are all of the rookies gonna be college players, and not photoshopped professional jerseys? Does anyone know if rare inserts such as Printing Plates are more commonly found in the regular Hobby boxes or Jumbo boxes? Or are the odds the same for both types of boxes? Jeff � Specific odds haven’t been released for these yet for 2014 Topps Football as the set isn’t out yet. Generally though, Plates are usually easier to find in hobby and jumbo. The base cards look like something from a bad Bowman baseballl set. Too crappy looking to spend actual money on. It definitely looks interesting…The base cards look Incredibly similer to last years, but knowing me ill buy a bunch anyway. We’ll see how they look……next year…If there is a next year. This is B.S.!!! Where is Brent Grimes??? 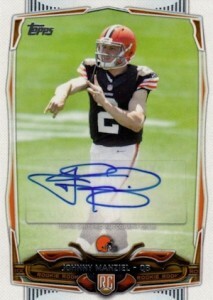 ONCE MORE TOPPS HAS OUT DONE THEMSELVES.THERE ARE AS USUAL WAY TOO MANY INSERTS.THE AUTOS. AND GAME USED ARE 95% OF “WHO”. SAVE YOUR MONEY IF YOU WANT THIS SET BUY THE FACTORY WHEN IT COMES OUT. THE FEW MOST PEOPLE WANT ARE EASIER TO BUY ON E-BAY OR AT A SHOP. SAVE YOURSELF SOME MONEY. WHEN TOPPS FIGURES OUT 95% OF SET BUILDERS DON’T CARE ABOUT THEIR B.S. INSERTS THEY MAY GO BACK TO BASICS. Hammer1 maybe u don’t follow football but I have heard of every player on that list. Missing some great 2013 All Pro Second Team linemen, for instance Staley (SF), Sitton (GB) and Yanda (Balt) – while mediocre Kyle Long (Chi) gets in; and no need to have 3 Balt tight ends (Dickson is 3rd string! ), old timers (like Ed Reed, who’ll surely be cut before Labor Day), or bench warmers like Indy’s Fleener. So only 4. Bought a blaster box and basically got a A.J. Green Kickoff Coin for the $20…the rest of the set was marginal. I’m just thankful and grateful that I didn’t get the PPK or P60 inserts. 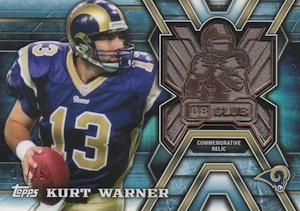 There was nothing that made me go “ooo” or “ahh” – I’m sticking with Panini products from here on – better “hit ratio”. 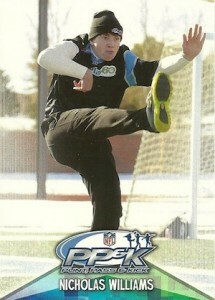 Thanks Topps for filling my packs with useless PPK and Play 60 cards. Who is interested in this? Agree that all the insert sets are waaay too large. Half a case and I am not even close to completing any of them (except 4000 yd). I do have about 300 useless PPK and Play 60 tho…. 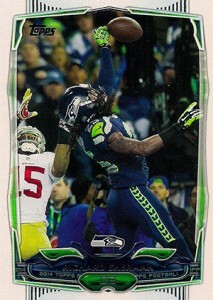 I sadly proclaim; “This is one of the worst set of cards Topps has produced”! Graphics are bad, way too many inserts, and why do I have PPK/Play 60 cards. Absolutely valueless. A very poor attempt in production. It’s no wonder Panini will be the main producer of NFL cards in 2016. NOT AUTOGRAPHS. THEY NEED TO LEARN HOW TO WRITE THEIR NAMES NOT JUST SOME MEANINGLESS LINES THAT LOOK LIKE A 1 YEAR OLD MADE. to many inserts and purchased three jumbo boxes and still don’t have a complete set. Inserts are a complete joke. Whats up with the NNOF with some of my base cards? Montyg � We have not listed the hobby odds yet. Jumbo info is what we had available. Hammer-1, I 100% agree with you. These days most auto cards aren’t even worth getting because these bozo players want to save time and give us some chicken scratches or their initials. They spend more time on their worthless tattoos then having a autograph worth a darn. It is very rare to find someone with a nice auto. Unless these guys become superstars, these autos are in the dollar bins within a few years. For a company that is rapidly losing market share to Panini, Topps has done astonishingly little to try and reclaim those lost, let alone do enough to retain those still loyal to the brand. 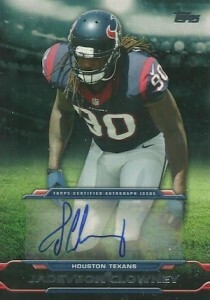 The auto inserts are poorly designed, IMO; Nothing more than the regular issue with an auto sticker slapped on it. All told, the parallels are countless, the PPK and Play 60 cards are thoroughly disinteresting unless the subject is a family member. The PPK and 60 cards are the dumbest, most useless and uninteresting cards ever produced by any manufacturer. The inserts in this product are cheap and never-ending. I have long supported Topps, but this isn’t a good release. Reading through some of the posts here I have noticed a trend. However, I’d like to remind everyone that all collectors start somewhere at some age. The set is not made to appeal to the needs of card collectors in their 20’s, 30’s 40’s, etc only. 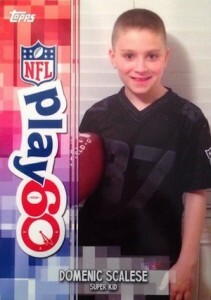 Some 6 year olds do it to and I’m sure they rather enjoy seeing any amount of cards with they’re favorite team on it. And before someone says that Topps should make something specific to the kids just remember that when you where a kid Topps didn’t make something just for you. Oh wait yes they did which would explain why cards used to have a stick of gum in the pack. It’s a good product for all purpose collecting. If you dont want the inserts in the set then stick to Topps Five Star so you only get the hits you want. On another note will the Kickoff Coin variations i.e. the STS /99 or BCA /50 be added to this checklist? Also is there a 1/1 variation to the Kickoff Coin? Don’t know if I’ll be getting a hobby box or jumbo after hearing the reviews.About to open a basic ten pack box and see what I get. 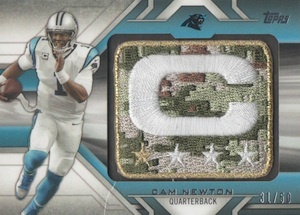 Are these captain patch cards the actual captains patch on game used jerseys? Please cease production of the mini cards that fall out of packs and are hard to protect. I hope some of these PPK kids turn out to be pros in 8-10 years, otherwise they’re not worth collecting. 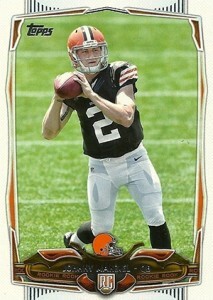 Topps failure. I’m very disappointed. 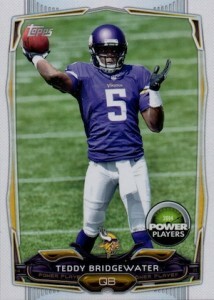 This product has been terrible for me to get Packer cards . 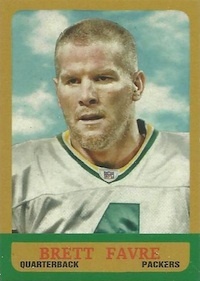 Bought several blasters and could not get aaron rodgers or jordy nelson once.. Had to buy a packer set on ebay.. 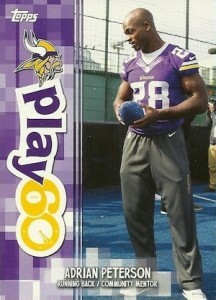 I can see why Panini will be the cards collected in the future..
Too many Fantasy/PPK/Play 60 inserts. Mini cards are okay. The set is impossible to collect. A lot of players that shoudnt be on cards and a lot that should have. Angelo mitchell � Welcome to a fun hobby! Most of the rare cards are serial numbered now. The easiest way is probably to check out the checklists and see the various inserts and such. I cracked 2 cases hobby 12 boxes, and found that i was very disappointed. Heres why, the jersey cards are not specifically game worn or event worn�. next issue, you get one auto or one jersey card per box, usually you get 3-4 autos and 8 jersey cards, the jersey cards simply don’t hold value. all cards end in #22 , rookie and veteran variations end in 51,52.
the variations are a fun mix and make it enjoyable when you find them. the power up rewards cards, these get 50 cents to a 1.00 a piece you can redeem but you only have to dec 2014 and or you can move them very fast. I simply dislike the design and I like to store my cards in a binder but with the writing on the card sideways it is about impossible to read and I think the colors are ugly and not well printed on te cards. For the cost get Score. I can’t seem to find any reference to the Triple Relic Card that came with my complete set. It is Aaron Murray, number 8. Anybody got any ideas? I opened a retail blaster and I was impressed. Got a JJ Watt coin and a gold border Brent Celek [go Eagles]. I also picked up a box w/ a relic card from Walmart and got an awesome Jordan Matthews Jersey. 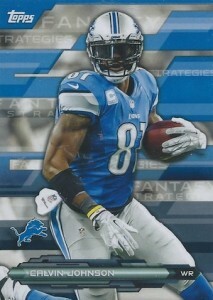 Also, base cards look awesome this year love the new design the only downside is the play 60 and pp&k cards. But still cool cards. 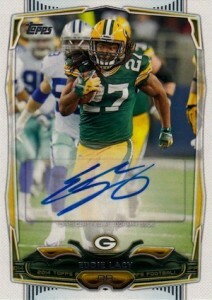 I really like topps football. love it. Cards are cool and love the design. love opening boxes! This set is the worst set I gave ever purchased. The fact that I paid money to open a complete worthless 6 year old girl ppk card makes me suicidal. I can not believe that was even an option. I opened packs and instantly through the play 60 inserts away. Garbage set. Nothing of value. After just getting ripped off by 2014 Topps, I am very happy to read they lost their license and will be no longer be able to make garbage cards like this again. Bye topps. I wish you the worst. The all pro team coin checklist is from 2013. 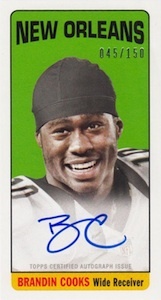 I’ve also got a green and white bordered autograph that I cant seem to find the list of. Its Jordan Reed #27. Any ideas? Does anyone have any info on the Power Players game prizes? I played the online game with the codes and won a few times. I received 2 Jimmy Garoppolo 1985 topps design autographs that are on card autos, but not serial numbered to 150 like the other ones. I can never find any for sale, print runs, or any other info on them. Any feedback would be greatly appreciated. 2014 TOPPS FOOTBALL FACTORY SEALED HTA HOBBY JUMBO BOX DEREK CARR ROOKIE ??? 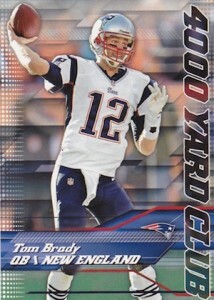 2014 Topps Factory Sealed Football JUMBO Box Tom Brady AUTO ?